If you want the look of sheers as well as the privacy that you get with blinds, then you should take a look at our exclusive privacy sheers. Why? Because our Privacy sheers are the best of both worlds, combining the look of a drape with the functionality of blinds. Our privacy sheers feature a blind with hard PVC veins covered by a soft, sheer drapery fabric. The result is we have the look and softness of a drape, but the functionality of a blind. For example, when you want to add privacy, you can simply shut the veins – just like you would with regular vertical blinds. This gives you full privacy from the solid PVC veins. When you want the elegant appearance of a sheer look, you can open the blinds. The fabric is actually velcroed on at the top and the bottom to the PVC vertical vein so the fabric can be removed for easy washing and cleaning. Our privacy sheers are perfect for a patio door, or any living room or dining room window. 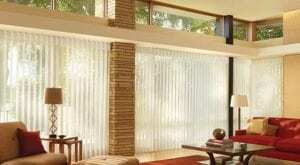 In the past, we have sold many, many vertical blinds. But with the advent of this new technology, many of our new clients (and many of our past clients) are switching to the privacy sheer. 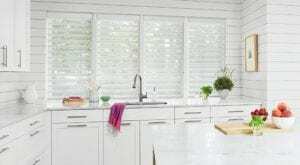 It simply outperforms normal blinds every step of the way and adds a distinct and unique appearance to match any décor. To learn more about privacy sheers or if you’re ready to have an in-home consultation with one of our professional decorators please call us at 775-322-8833.